The American twist to the British classic, fish and chips gets a make-over with the addition of polenta or corn meal for crunch. Moist on the inside, golden crisp on the outside is what this dish is all about, so download it today! Marinade the fish in Knorr Coating Mix Spices for 2 hours. Mix Knorr Coating Mix with Flour and Corn meal or Polenta. Coat marinated fish in dry flour mix and then dip into cold water for 10 seconds. Coat fish again in dry flour and mix. Deep fry in preheated oil of 180°C. Combine shredded carrots, cabbage and capers with Best Foods Real Mayonnaise. Add freshly chopped dill, lemon zest and Knorr Lime Seasoning Powder. 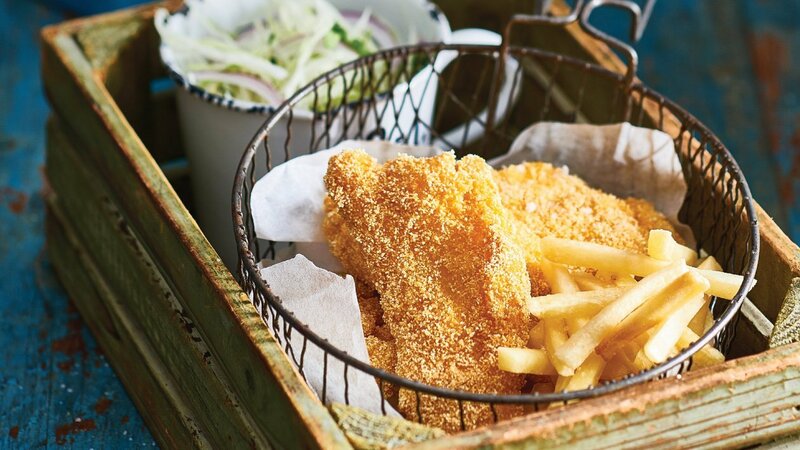 Serve Fish with French Fries and a Coleslaw Salad.